This was part of a longer conversation about priesting roles and How To Temple. I’ve been diving back into the Book of the Faiyum recently, and pondering what all of that means, and how to make sense of it when I don’t have a full translation. And how the Ogdoad is really caught up in all that mythology in a way I hadn’t really appreciated before, and I find that very intriguing. And so tonight I was pondering the old temples and priesthoods, and how to do that work today. He showed me one of the temples, and we stayed in the outer courtyard. There were a lot of people milling around, making their own prayers. Sobek said it was no good mysticing my way too high into the sanctuary if it meant I forgot what ordinary people brought to Him. And He reminded me that priests back then weren’t full time priests, and that neither should we be, as modern priests. If you need a day job, so be it. And He suggested spending one season a year doing work outside the temple. Do your magic for others, do community-building work, do volunteering, do whatever work comes to you. And then take that back to the temple. So that’s giving me a lot to chew on right now as I ponder how to wrangle this priesting thing into order and make it fit with everything else I’m being called to do. And I don’t think this is a terrible idea, either. I think it’s a good idea to spend some time each year doing more practical out-in-the-community work for a while to focus on others and see what needs doing, and not just spend all your time up in your head. It’s a grounding thing. So I might have to look at how to make that work for me, because I can see real value in that, if I do it right. But I thought I’d share in case it causes anyone else to have a ponder, too. This is a terrible angle because it’s from where I’m sitting down, and when I’m standing, I can’t see the underside of the top. Just pretend it’s white all over. IDEK. I was sitting down this afternoon to rewrite my daily rites since the ones in my ritual book are just for Sobek and Heru, and now I have Isis and Wesir to add to those and it was getting annoying having to flick through mid-ritual to the right spot, rather than have it all written out in the one place. But as I’m working on that, and reworking it, I’m pondering a different set of rites entirely, and then I get the urge to make a naos out of a box that’s lying around, and suddenly, there it is. If space and money weren’t an object, I’d just buy a cabinet and be done with it, but it’s a tricky spot and there isn’t much space, so this is what it is now. Apparently I need to be able to open/close the shrine more than I need anything aesthetically pretty at the moment, but I might bodge together a wooden version later on if I feel that’s a necessary next step. I may still switch things up as I work with it, and I may decide this is a terrible idea and make a wooden one sooner rather than later, but we’ll see. It’s felt like a very busy week, and it probably has been. Today has been the only day of rest, I guess, that I’ve had, with the exception that I was out tonight with my bff for her birthday, and now I don’t have the energy or preparation for deipnon, so that’ll have to be done tomorrow. All I can brain about now is tonight’s feast for Wesir, that’s all I have the energy for at the moment. But that’s okay. So it was the full moon on Monday, and I’m getting back into the swing of marking the moon cycles, with noumenia and the full moon penciled in at the moment. Hekate’s getting noumenia, and Isis the full moon. So that’s a thing now. 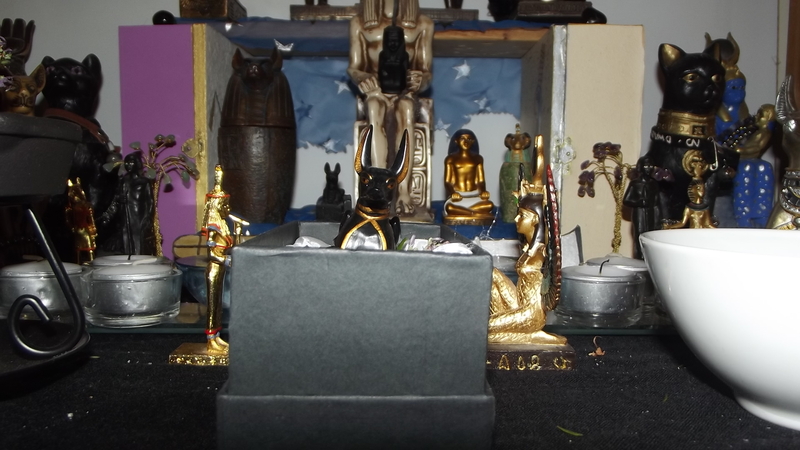 And so I did the libation rite for Isis, for lack of any other ritual ideas, and settled in for meditation with Her, because She’s been wanting to reconnect with me since I got the new statue, which is nice. And somehow, not surprising. Isis has always been in and out of my life, over the past sixteen years or so. And it’s been a while since we’ve had a proper devotional relationship. Actually, I think the last time I had anything like the daily devotional practices I have now with Her was back when I first started out, when I’d light incense for Her before school, and read out that prayer of awakening from The Mysteries of Isis. In some ways, I’m not surprised She’s asked to be back in my daily devotions again. But I can’t say I expected Her to request it last night. But I’m willing to go with it, if that’s what She wants. Any writing for the letters C or D- I am keeping this familiar format on week 4 for those who have joined me from the Pagan Blog Project. I am so behind on all my TPE posts, and it’s partly because I couldn’t settle on a topic for this particular week, but anyway. This is on my mind right now, so this is what you’re getting. I can’t say this will be organised; it may end up being a long ramble like most of my posts like this tend to be. Anyway. Have some thoughts on Coming Out As A Pagan, subtitle: Or why I find this concept far less terrifying than coming out as trans* and nonbinary. I guess I’m drawing on something I’ve seen around the traps lately, and having that feeling like I need to be more visibly Pagan. And I don’t mean that in any sort of obnoxious, in your face, sort of way. I’m a job seeker; I ain’t daft. It’s more subtle, and it’s particularly drawing on a growing sense of embodying the role of a priest, like it’s finally fitting in a way it never did three years ago. I’ve spent my time with Hekate, with Artemis, even with Isis, incubated in this transitionary cocoon, and it’s beginning to feel like that period of preparation is coming to a close. With it has come a growing sense of wanting to be seen, to be open about my practices, to not be afraid of being seen as Sobek’s priest. To wear that in public, even if it’s not in a way people would understand unless they asked. There will be a ring, and a pendant, and cords, but that’s it. The ring and the pendant are on their way, and there will be some rituals once they arrive to dedicate them to Sobek. Yinepu guards the body of Wesir, while Nebthet and Aset watch over Him. There is some rosemary covering Wesir’s covered body underneath Yinepu. I’ve rearranged the shrine again. The big jql statues flank each side, along with Sobek and Heru-sa. 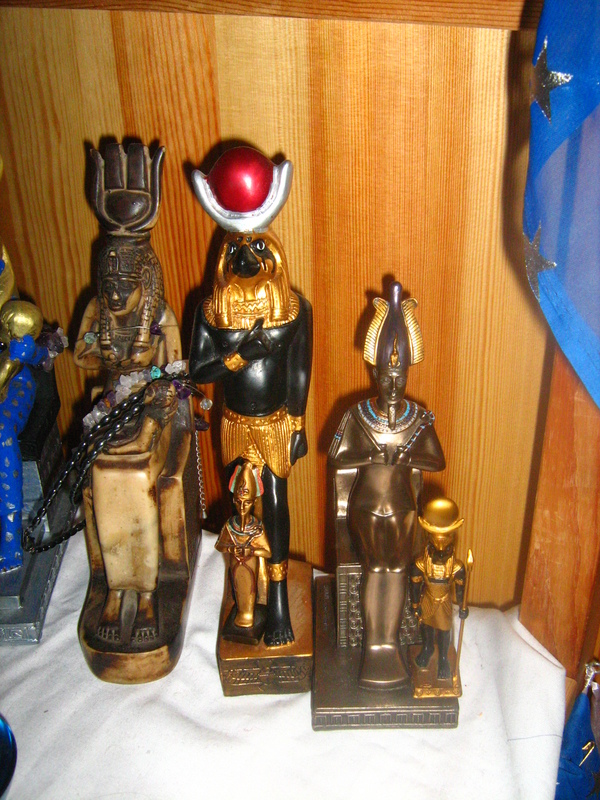 Cats and Asets at the back on each side, big Djehuty, Ma’at, two canopic jars, scribe, and another jql at the back, with Ra, Wesir, and the Holy Family on top. Candles, oil burner, and libation bowl, as well as a few sprigs of rosemary in a vase finish it all off. Still not sure how long I’ll keep vigil tonight. Tiler’s coming tomorrow to work on the bathroom that shares a wall with mine, and I’m not sure it’s wise to keep an all-nighter when someone’s going to come traipsing in at half seven in the morning. I might begin earlier, though. Parents are out tonight, and there’s nothing urgent I need to watch on tele, so maybe at 7pm, we’ll begin, so I can finish at 1am. Not ideal, but perhaps the best compromise between keeping the vigil, and not doing an all-nighter. I don’t think I’ve done much on this topic, now that I think about it. I feel like I’ve skirted around it, or not really mentioned it. Sobek did wait six years for me to finally figure out that’s what He was asking me to do, though. Perhaps it deserves more of a contemplation. …Ohwait. I did talk about priesting, but that was on my private blog, rather than my public one. WELL THERE YOU GO THEN. Maybe it is time to talk about it publicly then.